First of all I'd like to define two closed terms used often interchangeably – linguistic maps and language maps. another common feature (ALICPAA 1996). 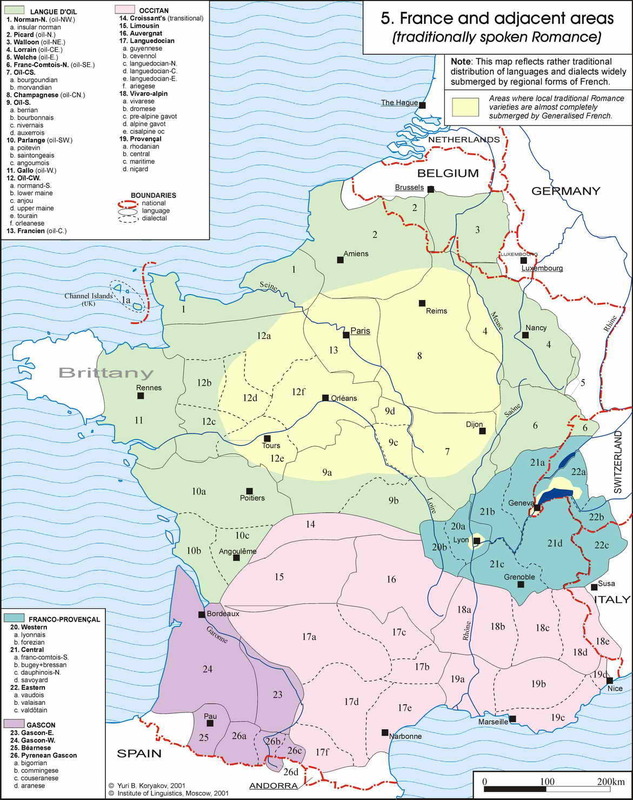 Those two different types of maps are connected with different branches of the Language geography. Linguistic maps serve for the linguistic geography which deals with regional linguistic variations within languages. And language maps proper are tool of the geography of languages which deals with the distribution of languages through space (and history). Usually most of works connected to language mapping deal to Linguistic maps, and more often to dialectological maps. 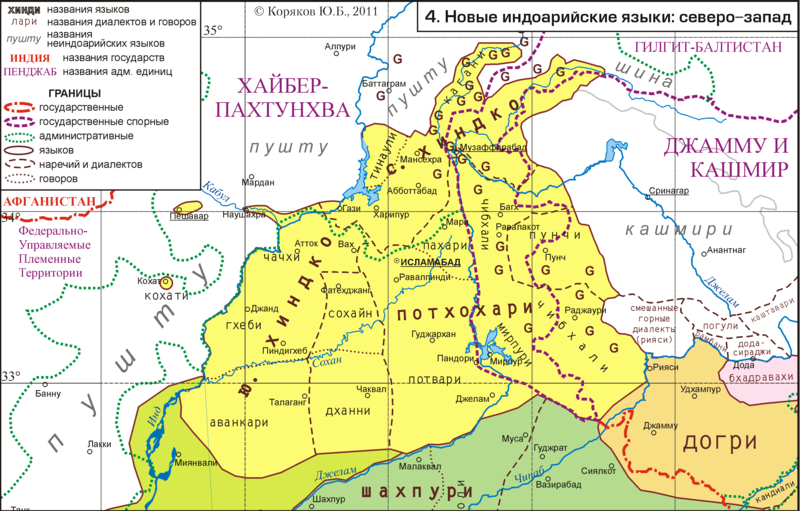 That is why we discuss below in more details the second type of maps – language ones. census (or similar) data. This type of data is good due to its large range and full coverage. Minuses are not always detailed elaboration of languages, inability to distinguish dialects, in some censuses data on perceprual mother tongue in place of real used language. Complexity in creation detailed maps on base of data of this type is that census data are usually available only for administrative units, not settlements or communities. field research by linguists. This type of data is usually available for smaller areas and have much less coverage. Based either on settlement basis or physical features (along such-and-such a river, in mountains and so on). surveys by linguists on base of correct samples. If sample is correctly built the quality of data from such a survey is comparable to that of census, and in the same time linguistic information quality can be made reasonably better due to competently formed questions. 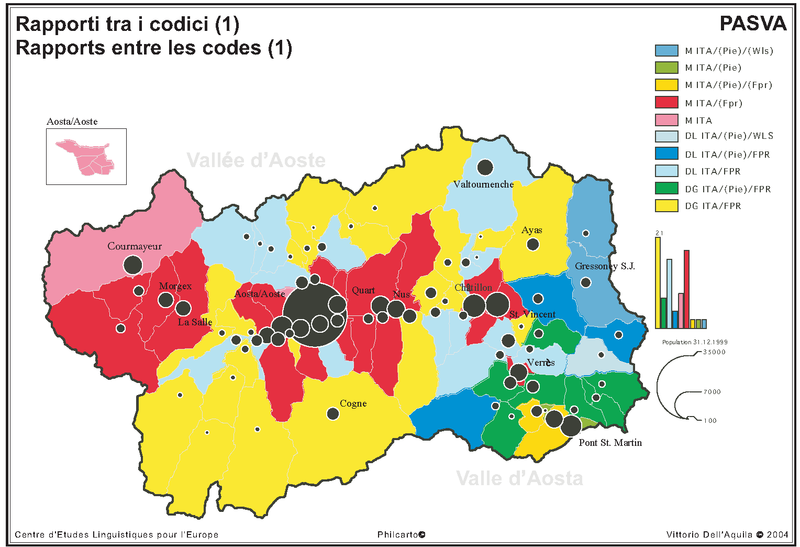 As an example see a map of types of diglossia in Aosta Valley (Dell’Aquila 2010, p. 464-468). 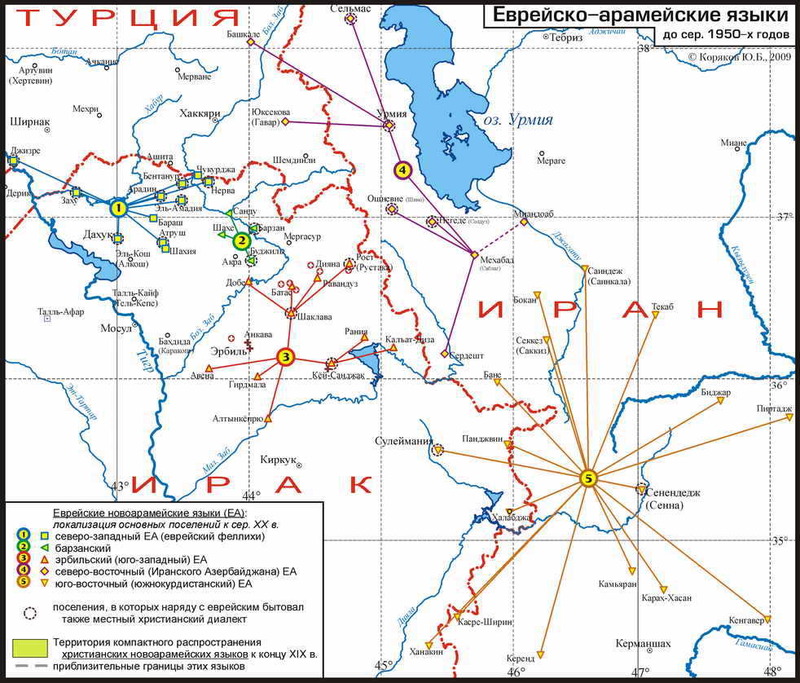 data presented on the base of administrative units. 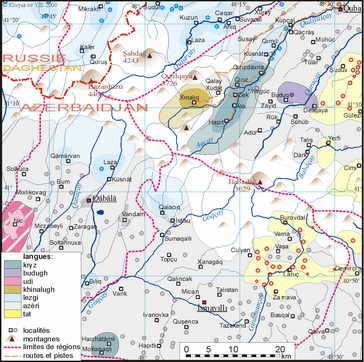 The more subdivided units are used the more detailed maps are produced. Source: Census of Serbia, 2002. Ideally, the language maps are created from large scale to small scale. At the first step, all settlements with language information are plotted on a map, then areas are drawn around them. Further, those areas are generalized according to the scaling down. 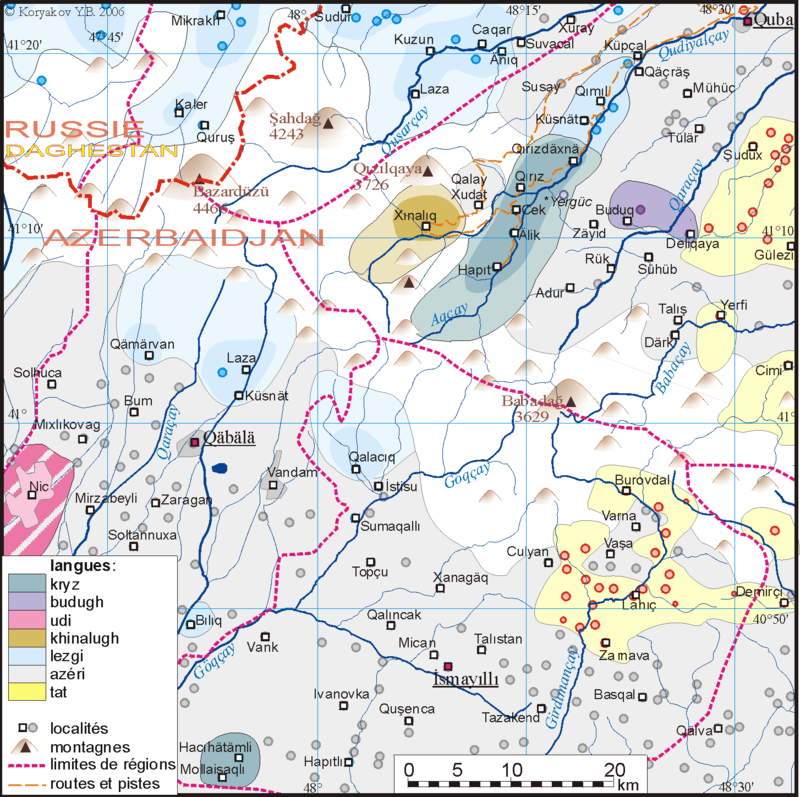 Language maps can serve variuos purposes, they are often used as a visualization enhancing language descriptions and encourage linguists to pay close attention to many specific aspects of language description. Source: Koryakov Yu.B. Atlas of the Languages of the World. Romance languages. Moscow, 2001. Языковые карты. Их применение и создание // Презентация, 2012. ACL = Коряков Ю.Б. [Koryakov Yu.B.] (2006) « Атлас кавказских языков [Atlas of Caucasian languages] », Moscow, Institut jazykoznanija RAN. Dell’Aquila, Vittorio (2010). « GIS and sociolinguistics », Schmidt, Jürgen Erich (ed. ), Language and Space, Volume 2. Language Mapping, Berlin, De Gruyter Mouton. Koryakov Yuri B. (2001). 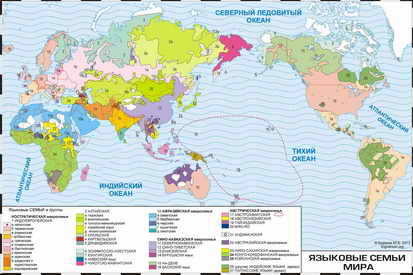 « Atlas of Romance languages », Moscow, Institut jazykoznanija RAN. Koryakov Yuri B. (2005). 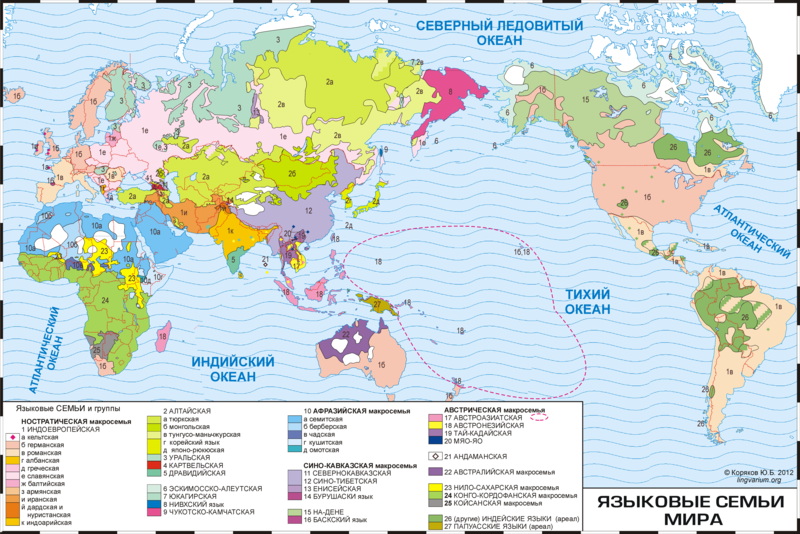 « Карта Языковые семьи мира » [Map of the World's Languahes families], Бурлак С.А., Старостин С.А. [Svetlana A. Burlak, Sergei A. Starostin] Сравнительно-историческое языкознание [Comparative-historical linguistics], Moscow, Academia. Koryakov Yuri B. (2007). 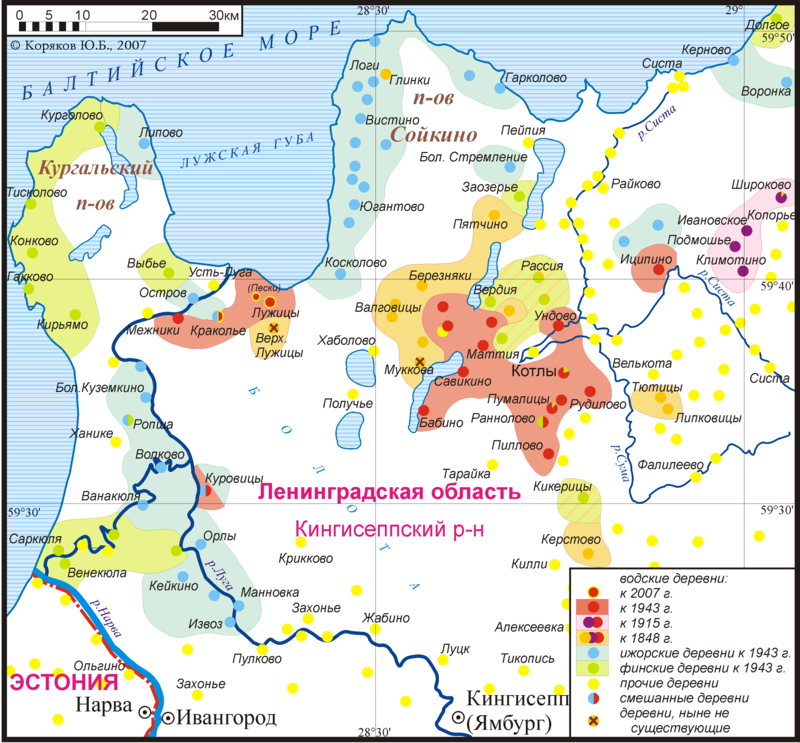 «Map of Vodic language area during the 20th century » Tat’jana B. Agranat, Zapadnyi dialekt vodskogo jazyka [West dialect of the Vodic language], Mitteilungen der Societas Uralo-Altaica 26. Moskva/Groningen, Societas Uralo-Altaica. Koryakov Yuri B. (2009a). « Carte 2 – Région de la langue kryz », Authier, Gilles. Grammaire kryz (Langue caucasique d'Azerbaïdjan, dialecte d'Alik), Paris, Peeters. Koryakov Yuri B. (2009b). « Maps of Semitic languages », А.Г. Белова, Л.Е. Коган, С.В. Лёзов, О.И. Романова (ред. колл. ), Языки мира: Семитские языки. Аккадский язык. Северозападносемитские языки [Anna Belova, Leonid Kogan, Sergei Loesov, Olga Romanova (eds. ), Languages of the World: The Semitic Languages. Akkadian. Northwest Semitic.]. Moscow, Academia. Koryakov Yuri B. (2011). « Maps of North-West Indic languages », Языки мира: Новые индоарийские языки / РАН. Институт языкознания. Ред. колл. : Т.И. Оранская, Ю.В. Мазурова, А.А. Кибрик, Л.И. Куликов, А.Ю. Русаков. [Languages of the World: New Indo-Aryan Languages. Edited by Tatiana I. Oranskaia, Yulia V. Mazurova, Andrej A. Kibrik, Leonid I. Kulikov, Aleksandr Y. Rusakov], Moscow, Academia. ALF = Gilléron, Jules et Édmont, Édmond (1902-1910). « Atlas linguistique de la France », Paris, Champion, 9 vol., supplément 1920. ALFE = Atlas linguarum fennicarum = Itämerensuomalainen kielikartasto = Лингвистический атлас прибалтийско-финских языков / Tuomo Tuomi; Anneli Hänninen; Seppo Suhonen; et al. / [1. osan vastaava toimittaja = otvetstvennyi redaktor 1 toma: Seppo Suhonen] ; [kartat = kaardid joonistanud = Kartengraphik = karty: Anneli Hänninen]. Helsinki: Suomalaisen Kirjallisuuden Seura : Kotimaisten kielten tutkimuskeskus, 2004. ALICPAA = Wurm, Stephen A.; Mühlhäusler, Peter; Tyron, Darrell T. (1996) « Atlas of languages of intercultural communication in the Pacific, Asia, and the Americas », Berlin/New York, Walter de Gruyter, 2 vol. « Atlas Linguarum Europae » (1975-2002), Assen/Roma, Van Gorcum/Poligrafico. EHHA = Charles Videgain (dir.) (2008-2010). «Euskararen Herri Hizkeren Atlasa » [L'Atlas linguistique du Pays basque], volume 1 à 3 et cédéroms, Bilbao, Euskaltzaindia [Académie de la langue basque]. OLA = « Общеславянский лингвистический атлас » [Atlas linguistique slave] (1965–2011), Moscow, Nauka. WALS = Dryer, Matthew S. & Haspelmath, Martin (eds.) 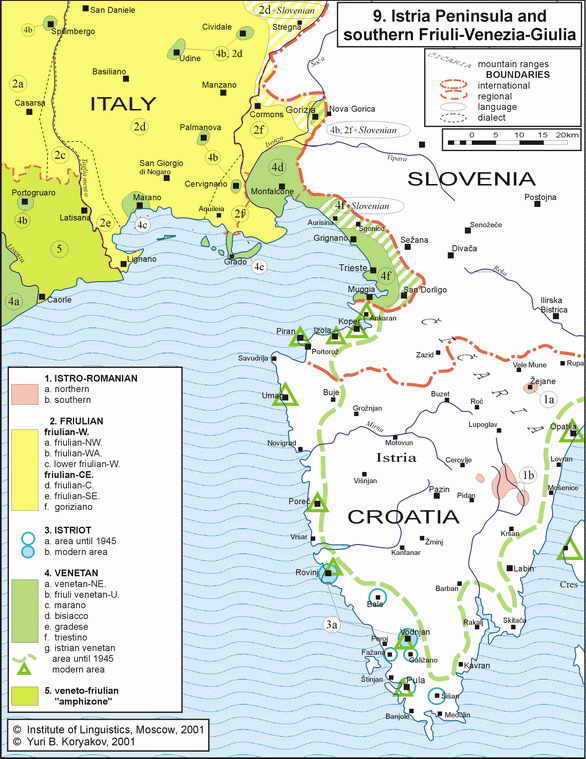 (2005) « The World Atlas of Language Structures ». Oxford, Oxford University Press. Wurm S.A. et al. (eds) (1987) « Language Atlas of China ». Canberra; Hong Kong, Longman Group (Far East).